Prepared similar to pilau, but the chicken etc is fried in spiced butter, rice and garnished with an omelette. Served with your curry sauce. Ideal for the inexperienced in oriental cuisine. Yet with stronger sauce appeals to the hardened addict. What a fantastic meal, a wonderful chef and great tasing food. Highly recommended. I've had more currys than I care to remember and this is by far the best. What a gem! 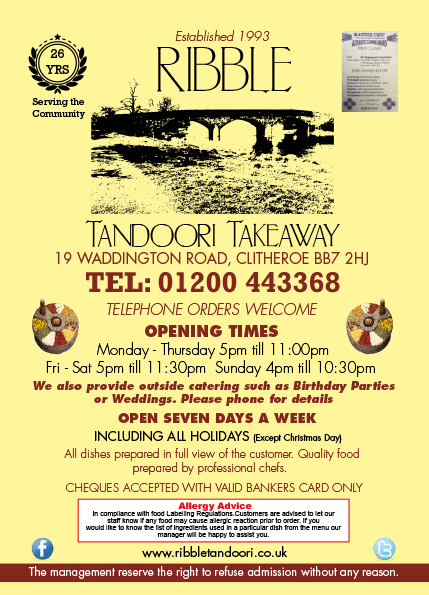 We regularly visit Clitheroe just so we can call for a takeaway from Ribble Tandoori. I just wish we lived closer. Fantastic little business. Well done! Please note we will never pass your details to any third parties and will only display your comment with your express permission.